The GMC Yukon and stretch Yukon XL are full-size SUVs that offer style, comfort and a primo Denali trim as well as a hybrid alternative. The 2013 gmc yukon xl 2500 electric vehicle qualifies for a federal tax credit of up to $7,500, effectively reducing the net base price. Whether you want an SUV that's big and powerful, flashy and full-featured, or is a relatively fuel-efficient hybrid, the 2013 GMC Yukon has a good chance of fitting your needs and style. Variety is aplenty in this full-size SUV that is a sibling to the Tahoe and Suburban from GM stablemate Chevrolet. This 3-row SUV comes in regular and extended lengths, with rear- (2WD) or 4-wheel drive (4WD), and with a variety of engine options, including a hybrid setup that enables this rig to achieve up to 23 mpg. In high-end Denali form, it can give a Cadillac Escalade a run for its money. If your needs are more pragmatic and involve towing up to 9,600 pounds, that can be accomplished with the three-quarter-ton 2500 model. If you regularly need to carry eight or nine people and their gear – and don't want to be seen in a minivan – the GMC easily accommodates passengers and cargo. Those who need serious towing ability will find plenty of it even in lower-trim models of the 2013 Yukon. If you don't need to tow heavy loads and would like an SUV that's more fuel-efficient and easier to maneuver, a vehicle such as the 2013 GMC Acadia or 2013 Honda Pilot would make a more sensible choice. The 2013 GMC Yukon carries over unchanged except for a new exterior color (Champagne Silver Metallic) and the ability to use powertrain grade braking in normal transmission mode to reduce brake wear when going downhill. Though their size can make these vehicles unwieldy to maneuver in tight spots, the 2013 GMC Yukon has a confident and civilized ride once on the road. The three V8 engines offered (5.3-liter in the Yukon, 6.0-liter in the Yukon XL and 6.2-liter in the Denali) offer decent-to-good passing power for such a large vehicle. In hybrid form, these SUVs team the 6.0-liter V8 engine with a pair of battery-powered electric motors to attain better fuel economy, something for which the other versions are not known. Even with the increased fuel economy, hybrid versions can still tow at least 6,000 pounds. Overall, the Yukon has a surprisingly comfortable, compliant ride. Gasoline models shift smoothly with their 6-speed automatic transmission, while hybrid versions use an electrically variable version and automatic start/stop function to conserve fuel. While SUVs and hyper-miling don't exactly go hand in hand, the Yukon does what it can to eke out a few more miles per gallon with GM's Active Fuel Management. The 5.3-liter and 6.2-liter engines use this technology to essentially turn their 8-cylinder engines into 4-cylinder engines when less power is needed. Fewer running cylinders means less fuel consumed. With the proliferation of smaller cars on the road, drivers of big vehicles such as the Yukon can only benefit from extra safety features. This one – standard on Denali and optional on SLT models – uses radar beams to keep high-tech eyes focused on the spots that yours may miss. Technically, the 2013 GMC Yukon can carry up to nine people across three rows of seats. But buyers who opt for this setup will likely be in the minority, as customers often choose the more comfortable setup of twin bucket seats up front. This also leaves room for a big center console between those seats to store items large and small. Indeed, this big vehicle's exterior dimensions and boxy shape give it the kind of space that could command rent in New York City. Even standard-length models have a good amount of cargo space behind their third-row seats. If you regularly need to carry adults in the third row, the XL is the better choice. The 2013 GMC Yukon definitely appears imposing. Park it next to a Yukon XL model, though, and watch how quickly the regular-length version disappears. At 222.4 inches long, the XL adds 20 inches and, from bow to stern, rivals 1970s' land barges like the Cadillac Fleetwood and Lincoln Continental. Denali versions add bling to the Yukon's outer box with features like a honeycomb grille, power-retractable side steps and 20-inch wheels. Hybrid models are slightly altered with a lowered front, and aluminum hood and liftgate for better aerodynamics and less weight. Denali versions of the hybrid ride on massive, 22-inch chrome wheels. A base 2013 Yukon SLE comes with power front seats, tri-zone automatic climate control, Bluetooth wireless connectivity, and AM/FM/CD stereo system with USB port and nine Bose speakers. SLT models add leather seats, power-adjustable pedals, rearview camera and rear-parking sensor. Denali models up the ante with a larger and more powerful V8 engine, AutoRide suspension for a more comfortable ride, heated and cooled front seats, 10-speaker sound system, and blind-zone monitoring. Hybrid versions, like Denali models, have navigation standard along with other features found in higher-trim Yukon SLT models. 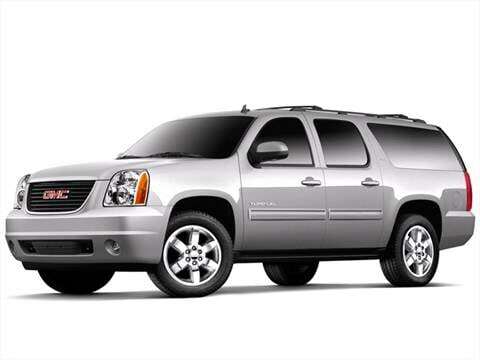 Many of the features found on the top-line 2013 GMC Yukon Denali can also be added to SLE and SLT versions as options. Among them are navigation systems and heated and cooled front seats. Other options include 4-wheel-drive, power moonroof, 20- or 22-inch wheels, rear-seat DVD entertainment system, heavy-duty trailering package, blind-spot monitoring system, chrome grille, and assist steps for easier entry into this tall SUV. The 2013 GMC Yukon and Yukon XL SLE and SLT models are powered by a 5.3-liter V8 engine that makes 320 horsepower and that can also run on an ethanol blend. Yukon XL 2500 models are heavy-duty, three-quarter-ton vehicles that use a 6.0-liter V8 engine good for 352 horsepower. Yukon Denali models use an even bigger, 6.2-liter V8 that makes 403 horsepower. Yukon Hybrid models are fitted with a 6.0-liter V8 paired to a 2-mode system that employs two 60-kilowatt electric motors. All models except the hybrid use a 6-speed automatic transmission, while the hybrid has an electrically variable transmission (EVT). The Manufacturer's Suggested Retail Price (MSRP) for the Yukon line ranges from about $41,000 for a rear-wheel-drive SLE model to more than $65,000 for a loaded Yukon Denali Hybrid with 4WD. The Yukon's starting price is in line with the other full-size SUVs such as the Ford Expedition, Nissan Armada and Toyota Sequoia. It is above that of the smaller Dodge Durango. Be sure to check the Fair Purchase Price on KBB.com to determine how much shoppers are paying in your area. In terms of resale value, the Yukon is like others in this category except the Sequoia – just marginal, with hybrid versions faring worse than regular models.